The proIMS Predictive Maintenance library includes functions and algorithms that allows equipment users and manufacturers to assess the working condition of machinery, diagnose faults, or estimate when the next equipment failure is likely to occur. When you can diagnose or predict failures, you can plan maintenance in advance, better manage inventory, reduce downtime, and increase operational efficiency. 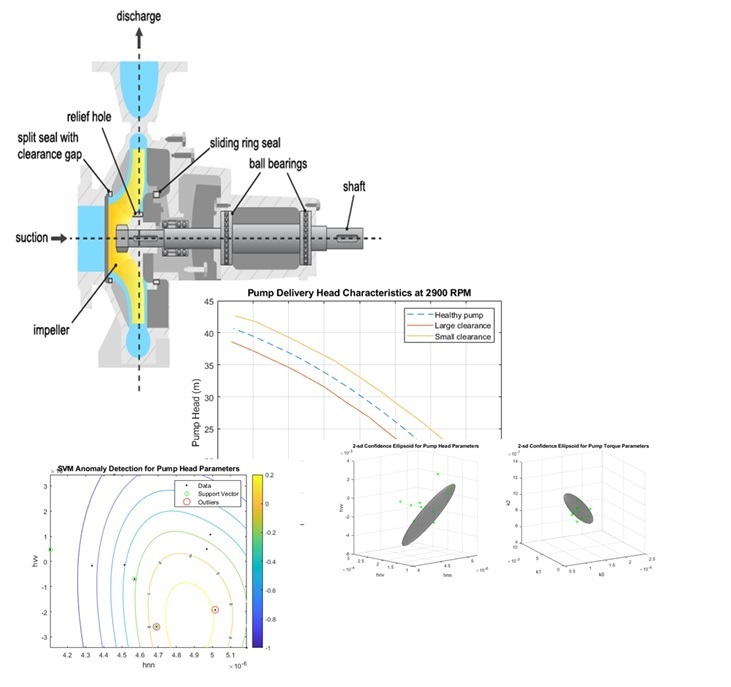 Signal processing and dynamic modeling methods that build on techniques such as spectral analysis and time series analysis let you preprocess data and extract features that can be used to monitor the condition of the machine. 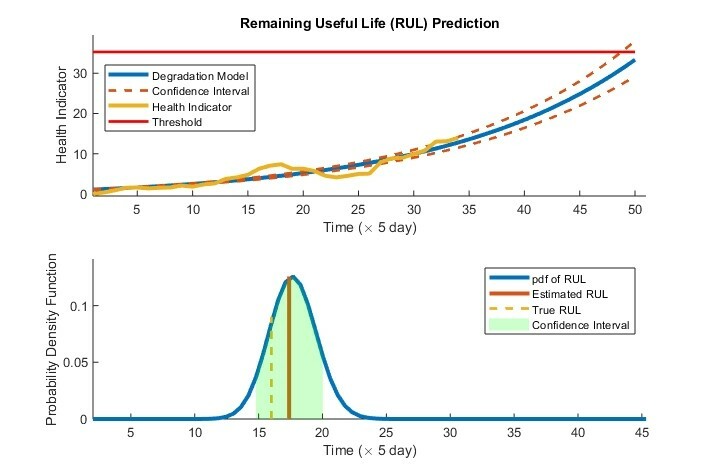 To estimate a machine's time to failure, you can use survival, similarity, and trend-based models to predict the RUL. One or more models are assigned to special industrial units to determine KPI’s which are used to inform about the status of the unit. The basic indicators use conventional methods like running hours or switching cycles. Estimating the remaining useful life (RUL) of a machine can help you predict its time-to-failure, optimize maintenance schedules, and manage spare inventory efficiently. The type of RUL estimation algorithm used depends on the condition indicators extracted from the data, as well as how much data is available. The library provides multiple algorithms for estimating RUL. If you only have data corresponding to when your machine failed, you can use survival analysis to determine RUL. Similarity-based models can be used when you have run-to-failure data for your machines that captures how sensor measurements change from healthy to failed states. When you have data corresponding to condition indicator values over time, as well as information about critical threshold values that indicate failure for those condition indicators, you can fit linear and exponential time-series models to your data to forecast when these thresholds will be crossed. Condition indicators are features extracted from your data using time, frequency, and time-frequency domain methods. The values of these indicators typically change in a predictable manner as the health of the machine degrades over time with use. Engineers can detect the onset of faults in your machine and take remedial action by continuously monitoring these indicators for significant changes. Condition indicators are also used to estimate remaining useful life and to develop diagnostics using machine learning techniques such as classification and regression. The methods in the library provides capabilities for designing condition indicators using both signal-based and model-based approaches. You can calculate time-frequency moments that enable you to capture time-varying dynamics, which are frequently seen when analyzing vibration data. To detect sudden changes in data collected from machines displaying nonlinear behavior or characteristics, you can compute features based on phase-space reconstructions that track changes in your system’s state over time. It also provides a wide range of capabilities for feature extraction using statistical methods, spectral analysis, time-series modeling, modal analysis, and other methods for designing condition indicators. Machine Learning algorithms are a new approach in predictive maintenance. They are not field proven. However, when using this models with one of the conventional models like condition indicators they can be a useful supplement to conventional models. Please feel free to contact us directly or use our contact form. Note: You can revoke this consent at any time with future effect by sending an e-mail to info@proasset.net. Also we look forward to a recommendation on social media.